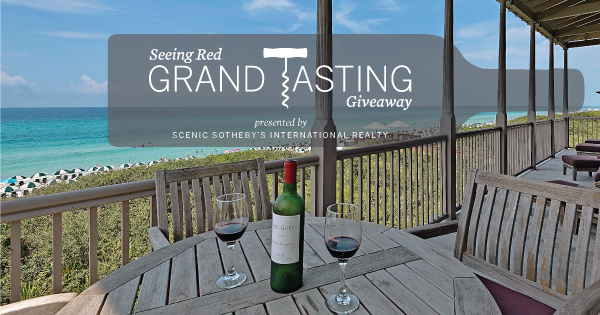 Tickets to the SEASIDE® Seeing Red Wine Festival Grand Tasting, taking place November 7, are SOLD OUT, but as an event sponsor, Scenic Sotheby’s International Realty is giving away two pairs. Each pair is valued at $300. One pair will be accompanied by a 4-night stay at a 5-bedroom home in WaterColor during the festival, courtesy of Five Star Beach Properties, valued at just under $1,700. Click here to enter and for contest details! The contest runs Wednesday, October 14 to Wednesday, October 21. We will announce the winners Friday, October 22. Benefiting Destin Charity Wine Auction Foundation, the festival will be taking place in and around Seaside, Florida November 6-8, 2015. It is one of the area’s most highly anticipated events. 100% of event proceeds benefit the Destin Charity Wine Auction Foundation. Named one of the top charity wine auctions in the nation by Wine Spectator Magazine, the foundation donated a record-breaking $2.3 million to 14 Northwest Florida children’s charities in 2015.